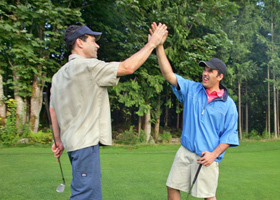 The GBC Golf Academy has it all. We combine a world-class practice facilities with beautiful surroundings and expert instruction to offer an unparalleled learning experience. Our Academies at the participating GolfBC courses in British Columbia offer a variety of lesson programs designed to help golfers of all ages and skill levels. From private programs to golf schools, our experienced teaching staff at the GBC Golf Academy at The Okanagan Golf Club in Kelowna is on hand to ensure your time with us is both rewarding and fun. At an early age of about 8 or 9 years old, Conner began to develop a strong passion for the sport of golf. This passion only grew stronger into his teens as he began to notice continual improvement in his game and in competition. Following a junior golf career highlighted by several championships and top finishes in high level competition, Conner had the privilege of being recruited to play varsity golf at the University of British Columbia. While pursuing a degree in Kinesiology, he was named team captain for three out of his four years on the team. During his time on the team, Conner was able to help lead the T-Birds to numerous tournament wins and national championships. Now as a professional, he believes in growing the game at all levels of play and is driven by providing the opportunity for others to love the game, just as it was once given to him. Neil has been a member of the Canadian PGA since 1962 beginning as a club Head Professional, and finishing up as a Director of Golf. The last 9 years he has been a Teaching Professional at the Okanagan Golf Club. He is not a believer in rebuilding golf swings, but prefers to work with what talent people have and improve that talent, along with spending serious time on the short game of 100 yards and in, to lower scores and handicaps, and make the game and practice fun and enjoyable. Lower scores guaranteed! !